It was close, but not even the "dearly departed" Prince vote could overtake Cyndi Lauper for HER hit song, "When You Were Mine." All credit to Prince for his phenomenal song writing abilities but when Cyndi gave it a whirl, she owned it. LOVE Cyndi Lauper but debating whether or not to get her new album Detour as I'm not a huge country music fan, although I like some. I'm going to have to hear a few songs from it first. The End Of The World wasn't bad... it's on Spotify. I heard she was doing country, but it seems like country is a whole lot of POP lately, so it shouldn't be too much of a stretch. Thanks, Chris, for the tip! A good try, but no cigar for Prince. I didn't know this song. From the 1980s, eh? Yeah, someone told me there'd been a decade called "the 1980s" but I didn't believe her... until now. I don't know you'd think I'd like to you???? Do I need to send you YouTube footage? Please don't tempt me. You know I'm a YouTube addict. She's pretty reliable and has a nice catalog to choose from...but so does Prince! In the end, it's just what you like, right, sage? Poor Prince! I don't remember this one. I love the haikus. My nose runneth over too these days! I'll have to pop up another haiku, I forgot it was hump day! Thanks, Tamara! It's a pretty polished version of the song and she was an MTV icon for a while there. Never been a huge Cyndi Lauper fan but I do feel like she deserved the win. Good battle! Thank you, my brothers - I think this one was pretty evenly yolked when you put a bonafide hit for Cyndi against the song's writer and give him the added "RIP Prince" vote. Congratulations, Cyndi, but I'm still waiting to just have fun. Great win for Cyndi! She's so much fun to listen to. Really, she was a fun character all the way around in the 80s. Thanks, Mary! I'm going to reply to the comment you left on my blog here. Mostly because I'm just too tired to reply to all of the comments (though all are very much appreciated!!! and don't want anyone to feel slighted). I think the people get all bent about comments is that they take it all very personally (when it isn't personal at all). This internet has created something of a middle school mentality.... if you're one of the popular kids people like or comment on your stuff. If you're not, well you're unworthy (again, still, for the first time). Whatever. It's like the entire experience throws us back to our insecure 13 year old selves. I went through a very bad period on Facebook (mostly because I was already in a bad place), but the whole "like" button gave me anxiety. And I eventually figured out that it made me feel like I did in junior high school (which is migraine-causing). I had to shut down my entire Facebook for a while (not delete, but not log in) until I got my head on straight. It doesn't matter if ONE person likes something I post, no one likes it, or everyone on my Friends list likes it. It really doesn't matter. If I like it, I like it. That's it. I also had to realize that Facebook wasn't a forum where I was going to change hearts and minds. Now, that said... this isn't Facebook, which is better and worse. Better because I think the people genuinely care about someone that they might only know via this blog (versus in real life). Worse because without that real life connection things can get lost. Words can be misconstrued. Feelings can be hurt completely without intention. And then there are those folks who are mistakenly trying to find their self worth in the amount of followers or comments they have. I just want to wrap my arms around them and say, "You'll never find it here. Look inside your own heart." So, the next time you think your head will pop off think about what is actually going on. Are they worried? Did they misunderstand? Are they looking for their self worth in their blog? And then pray for them... because whether they know it or not, they need it. And prayer WORKS. This is an abundance of wisdom that far outweighs the size of the post! You are totally, absolutely correct in this assessment. I had a moment yesterday when I really got miffed at the negative "reflections;" some people take this waaaaay too seriously and what is with the whole hater mentality towards the number of comments or visits? Have I been doing it all wrong because I don't keep a score card? I don't get it. I don't know what is going on with anyone else in the real world; I wouldn't dream of slamming another blogger over such a thing. As you know, I'm not a fan of any of the mean spirited stuff. Life is too short and there are far bigger issues in the world. And girl, you KNOW I love you to pieces, too. Put that on Ye Olde Scorecard for the win. Yay! I'm waiting for her to call! Can I give her your number, too? Absolutely. She's close to my age and cute. It's a win win. So Prince didn't win an overwhelming sympathy vote which is good because his version was slightly annoying--not bad, but not as good as Cyndi's. The falsetto voice is always a hit or miss with me. Now, if I had put a live version of Cyndi next to that Prince recording, it's a little more of a close race. Cyndi "live" suffers on th is particular tune, IMHO. Thanks, Arlee! At least my selection won. Sorry Prince. PS - Finally posted my results page. 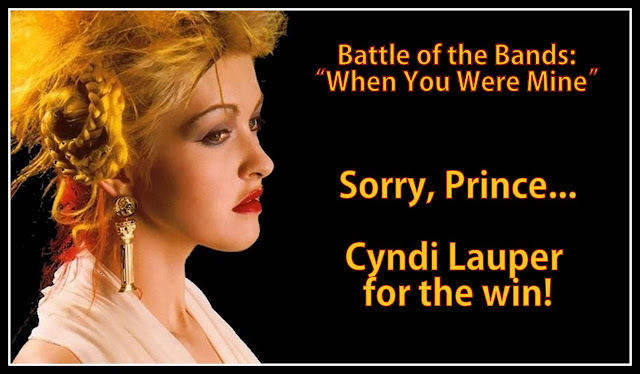 Sorry for Prince, but you can't beat Cyndi. Cyndi Lauper does wistful awfully well.